An international team of astronomers, including Dr Simon Vaughan from the University of Leicester’s Department of Physics and Astronomy, has discovered a previously unknown link between the way young stars grow and the way black holes and other exotic space objects feed from their surroundings. The study, ‘Accretion-induced variability links young stellar objects, white dwarfs, and black holes’, which is published in the journal Science Advances, shows how the 'flickering' in the visible brightness of young stellar objects (YSOs) - very young stars in the final stages of formation - is similar to the flickering seen from black holes or white dwarfs as they violently pull matter from their surroundings in a process known as accretion. The researchers found that relatively cool accretion discs around young stars, whose inner edges can be several times the size of the Sun, show the same behaviour as the hot, violent accretion discs around planet-sized white dwarfs, city-sized black holes and supermassive black holes as large as the entire Solar system, supporting the universality of accretion physics. The study found a relationship between the size of the central object and the speed of the flickering produced by the disc, suggesting the physics of the accretion must be very similar around these different astronomical objects despite them being completely different in other ways, such as size, age, temperature and gravity. The new observations were obtained with Kepler/K2 and ULTRACAM, examining accreting white dwarfs and young stellar objects. 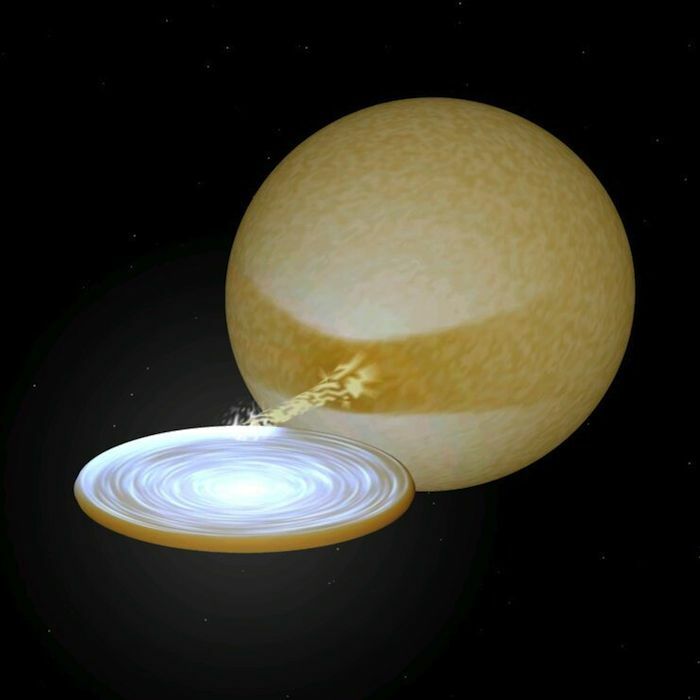 Accretion discs are responsible for the growth and evolution of most celestial objects, from young protostars still in the star forming process to ancient supermassive black holes at the centre of galaxies. NASA’s Kepler/K2 telescope can ‘listen’ to the seemingly random brightness variations produced by accretion discs, revealing how they all sound the same once scaled by their physical size. Accretion therefore is a universal process operating in the same way across all astrophysical objects. The study was led by Simone Scaringi, a Humboldt Research Fellow at the Max Planck Institute for Extraterrestrial Physics in Garching, Germany. The UK universities involved in the project are the University of Leicester, the University of Southampton, the University of Warwick and the University of Sheffield. The initial study received funding from the Science and Technology Facilities Council.